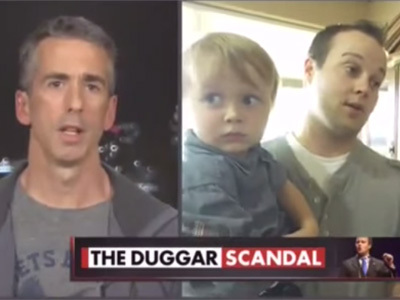 Dan Savage highlights the hypocrisy of reality TV's Duggar clan, who painted LGBT people as child predators while their oldest son was allegedly sexually abusing underage girls. On Friday’s episode of All In with Chris Hayes, author and LGBT advocate Dan Savage made an appearance to discuss the story that continues to unfold surrounding allegations that a member of reality TV’s Duggar family, Josh Duggar, molested five underage girls in his teen years more than a decade ago. Now 27, Duggar headed the lobbying arm of antigay Family Research Council, from which he resigned on Thursday. Savage highlighted the hypocrisy demonstrated by the Duggar family, who have peddled their anti-LGBT agenda and activism as a means of protecting families – including campaigning against an LGBT rights ordinance in Fayetteville, Ark., which cast transgender people as child predators. Watch the full segment in the video below.